It’s been a while! Last year was very busy for me and involved two big life events. One – I got married. Any woman who has ever had a hand in wedding planning can sympathize with me on that one. Two – my husband and I moved out of New York City into the suburbs of New Jersey. Big change! Now that things have settled down a bit we have turned our energy to a big project for this year. That project started in March with packets of seedlings I ordered online. These packets included heirloom and organic varieties of various vegetables and herbs good to grow in our region. We started the seedlings in peat pots of organic potting soil, set them up in our sunny (empty) spare bedroom, and bought a grow light. Viola! We had the makings of our very first vegetable garden. In April we have built two large raised beds in our backyard and filled them with organic garden soil, compost, and aged manure. The perfect medium for growing vegetables. This past weekend we transplanted our cold weather seedlings like cabbage, cauliflower, and kale from peat pots to the garden. We also direct sowed cold weather seeds like carrots, parsnips, radishes, lettuces, snap peas, and some varieties of beans. 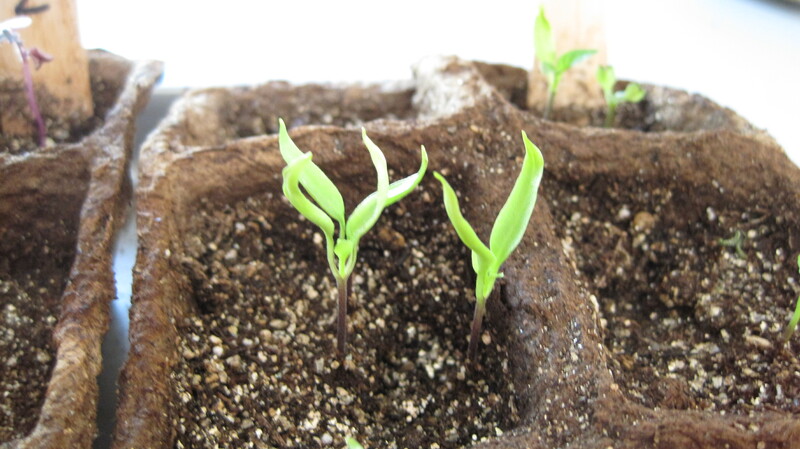 Our peppers and tomatoes are still in our “incubation” room where the temperature is warmer and the light is brighter. I look forward to watching the plants grow and learning about organic gardening. I may have been over ambitious for a first timer, but I am playing the odds. I figure the more variety I plant and try to grow, the better the chances are that I will have something to harvest in the next few months. In addition to the vegetable garden we have a compost pile started in a closed bin in the backyard. We hope to reap further benefits from all the kitchen, garden, and plant scraps by turning them into organic compost for next years garden.